Photocaged DOPA derivatives may serve for non-invasive unmasking of the catechol fragment in biological systems. This would enable efficient control of the redox and metal-coordinating properties associated with the free catechol moiety, in particular, in biosynthetically produced adhesive proteins and synthetic peptides. Synthetic routes towards photocaged DOPA derivatives are reported herein. 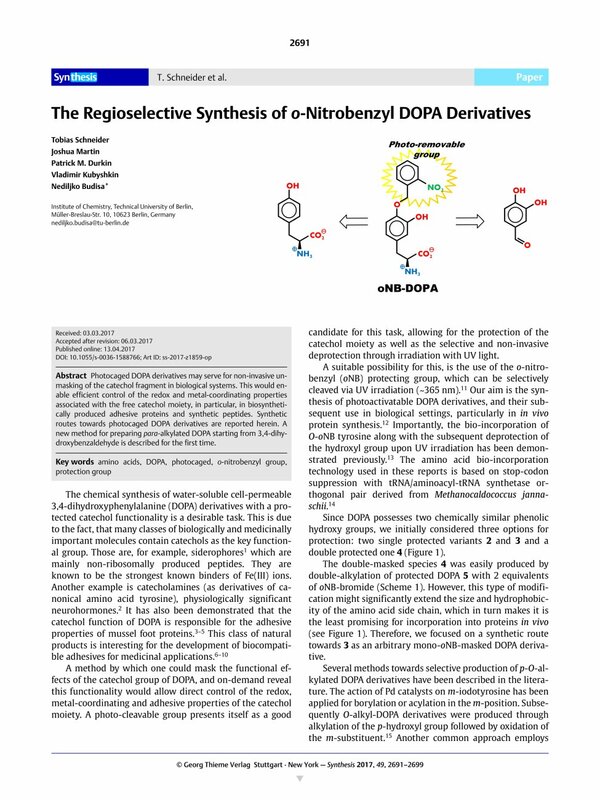 A new method for preparing para-alkylated DOPA starting from 3,4-dihydroxybenzaldehyde is described for the first time. Supporting information for this article is available online at http://dx.doi.org/10.1055/s-0036-1588766.